If you wake up to a morning that isn’t 100% clear thoughts, smiles and motivation, you’re not alone. In fact, only one-third of all people surveyed consider themselves a “morning person,” according to Research House. However even for creatures of the night, the benefits of a motivated morning are hard to deny. According to MedPage, “a new study has found that college students who consider themselves ‘morning people’ are more likely to have better grades than those who are ‘evening people’. In fact, the benefit of being a morning person was a full letter-grade difference.” So, whether you are a student or a 9–5 business professional, psyching yourself up to work awesome is crucial! Standing in line at Starbucks is such a drag. Set your coffeemaker to brew before your alarm. You will wake up to the nice smell of coffee and have a perfect cup ready to go. If your coffeemaker doesn’t have the ability to auto-brew, it may to time to check out new ones. WebMD states that people who drink coffee regularly “have fewer cases of certain cancers, heart rhythm problems, and strokes.” If that isn’t enough to psyche you up, I don’t know what is! The best mornings are the ones where you don’t have a worry in the world. Set the ambiance in your room before you doze and you will be surprised how cleaning up a few socks and towels from the ground can clear your head and make your sleep better. If you want to wake up with a fervent passion for life, put a motivational poster in your bathroom. During your morning shower, you will be able to think about what you can do during the day to better yourself. What song are you currently jammin’ to? Be careful in your song choice when setting your alarm. Don’t choose just anything that gets your body moving; choose a song that you aren’t afraid to get sick of (you don’t want to hate Bohemian Rhapsody for the rest of your life). That one song should be something that has a positive spirit, and is vaguely recognizable to you. When setting your phone alarm, the section of the song, volume and mp3 format matter most. Each of your individual settings depends on the type of your phone; however you can edit your audio files to suit your needs with Audacity. Audacity is an open source, free tool to edit and modify audio. Think about making a mash up of your two favorite songs, think: Eye of the Tiger meets Eminem. You should never wake up to a boring cell phone alarm again! Setting an alarm on your computer is a potentially better option. For instance, you are allowed more flexibility in your wake up options; you can play Pandora, flash a bright screensaver, or blast a random track from iTunes. 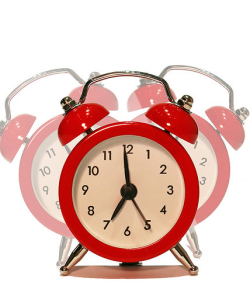 If you are a proud Mac owner, Alarm Clock Pro can be set to open any application. You can set it to play a YouTube video or Pandora, the possibilities are endless. Experiment with what works best for you. Formalizing something in to a habit in the morning can be a positive or negative thing. A bad habit is hitting the snooze button, and a good habit is waking up before the alarm to read your newspaper. Create something that will positively impact your life and formalize it into a habit. I know someone who wakes up, and before touching his feet to the ground cranks out 25 pushups—he is the best morning person I’ve ever met! Sitting in traffic on your way to work can be super frustrating. According to Businessweek, Harvard University public policy professor, Robert D. Putnam says, “the costs of commuting — in gas, congestion, pollution, sprawl — are high. Get your commute under control! Go to Google Maps, and route out alternative directions ways to get to work. If your commute consists only of driving, leave 15 minutes early take the back roads, enjoy the scenery and get there on time! If you are a hybrid commuter, taking some form of bus/train/taxi combo, think of ways to optimize your commute. If traffic is an issue, maybe it will save you 30 minutes every morning to leave an hour earlier? You could grab breakfast, hit up the gym or get some extra work done. There are easy ways to bypass the stresses of commuting. How do you wake up to an awesome day every morning? Share your tips below. Matt Krautstrunk is a writer, social entrepreneur and dreamer living in San Diego. He works for Resource Nation, an online service that provides telephone systems purchasing advice for small businesses and entrepreneurs. So You Think You're Ready For Management? Think Again. i think the productivity world glorifies drinking coffee. it’s highly addictive and can actually make your energy levels worse off after your first hits. That’s true, but a single coffee in the morning can help you jump start your day. I for example often drink a single coffee in the morning to get rid of the morning ‘haze’. This helps me get on with the work I have to do. Very often it’s my only coffee of the day. The whole business world glorifies drinking coffee. I agree that it’s highly addictive but I think it has some benefits in terms of regulating energy levels. All said, I’d probably be better off without it. I’ll second the routine! I like to read a quick chapter of book each day at breakfast such as Jesus CEO, or a couple pages from something from John Maxwell (Good to Great). Speaking of breakfast, a hearty breakfast boosts my productivity right up to lunch time. Wow, Best Tips Ever !!! These are the exact issues I face after I woke up & now that you have pointed it to a great solutions – I guess it will really make my day awesome. Love your clear and actionable ideas. I’m going to try audacity for my phone. For commuting, I love downloading a podcast onto itunes, then listening to its motivational message as I sit in the car. Great post and I am a big believer of the morning routine. I usually wake up before my alarm and immediately go downstairs to make coffee. While the coffee is brewing I’m checking up on Twitter / Blogs via my iPad and quickly scan my emails. That’s when I start coming up with ideas for the day. Once the coffee is done I get to my desk and start returning emails and catching up. I love your article and would be interested in featuring it in one of our weekly newsletters. Please get in touch with me if you are interested. Great list, Matt. Waking up to a clean room is so underrated. It’s amazing how disorder and clutter can affect your day, and your level of stress. Turning some of your suggestions into habits are great advice for feeling good on a regular basis. I like this article and find it very inspiration for my daily life. Thank you so much for such a nice article. Thanks guys for the awesome feedback. I am going to try the push up thing. I try to eat a heavy protein meal within 30 minutes of waking up, drink coffee, read The Secret and take a walk all in the first 2 hours. Awesome, love it, should help me move on from the usual growl at the wife, and the swearing in the shower…. The reason people need coffee is because they have too much fat (especially heavy protein fats) in their diet. Move to a low fat plant based diet and you’ll not only wake up chirpy, you’ll need less sleep too. 4 to 6 hours per night max. I usually hit the snooze button about 3 times before finally getting out of bed, I guess its not that bad considering that my alarm is set for 04h30 and I am usually out of bed at 04h45… I am certainly going to set my iPod to play “Sky is the Limit” by the Notorious B.I.G tomorrow morning. Great article. Remember that getting up feeling good in the morning requires getting to bed at a decent hour too! Work backwards from when you want to get up, and remember to get to bed with enough time for your usual length of sleep plus an hour to get settled and actually off to sleep. Catch the bus, get a good set of closed headphones or isolating in-ear buds, listen to some podcasts from people you consider successful in their fields – or just listen to great music! And finally – look for a job you enjoy, so you’ll want to get up and off to work! Don’t forget the exercise! Nothing better than getting the blood flowing with fresh oxygen to help you wake up, feel refreshed, and ready to start the day. I typically awake at 545a, have a few sips of coffee an a bit of banana, yogurt or granola while i scan emails, then hit the gym for 30-60 min depending on the day. Back home, finish breakfast (more protein this time) and then get ready for work. AS soon as you are concious, hold your breath for as long as you can. It will be about twice as long as you can do it during the day. This will wake you up and refresh you, and if you keep doing it every morning, boost your lung power gradually. Great list here – I will def implement the clean/organized sleeping space and give the mac alarm a try. thanks for the list and tips, very helpful, im now enjoying my mornings with a nice big bowl of cereal! helps you feel refreshed and ready to GO!! Another good tip is to make sure you NEVER have to hurry. I calculate an hour to shower, have breakfast and do some excercises. I have spare time to relax. This is a useful tip indeed would probably gonna start to do a closer look with my life to create an awesome day.